TreeRunner West Bloomfield Adventure Park is a premier aerial adventure park in the Metro Detroit area. In 2018, we were voted Michigan’s #1 zip lining and climbing venue. With 195 exciting obstacles, 41 zip lines, 6 difficulty levels, and 12 different trails, there is plenty to explore! We also feature a Junior Park for ages 4-7! Experience our aerial trails in the trees on your own or with friends and family! This is the perfect outdoor adventure for birthday parties, team building, school field trips, and special events. We are located at 6600 West Maple Road, West Bloomfield, MI on the campus of the Jewish Community Center at the corner of Drake and Maple (15 Mile) roads. For easy access, the entrance and parking lot are on the west side of Drake Road. 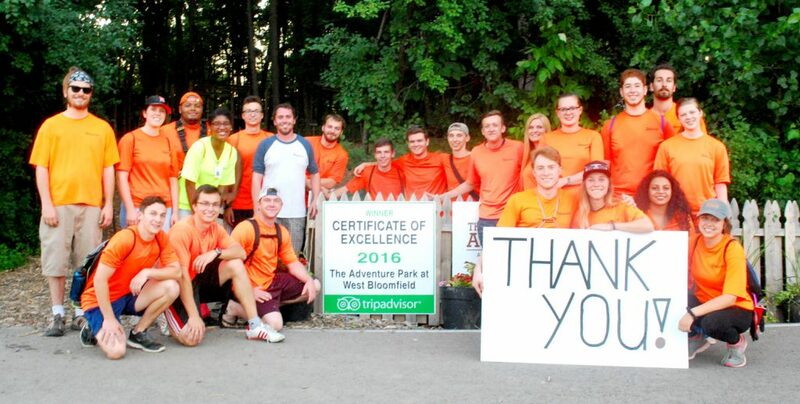 Book your experience at TreeRunner West Bloomfield Adventure Park today! TreeRunner Adventure Parks was founded by a team of Michigan Entrepreneurs. TreeRunner Parks currently owns and operates three aerial adventure parks nationally – two in Michigan, and one in North Carolina. Currently, under construction, a fourth TreeRunner Park is being built on the campus of Oakland University in Rochester, Michigan. Our mission is simple: TreeRunner Parks provide a unique and challenging experience for individuals, families, or groups to accomplish and achieve through physical challenges within a natural forested setting. Originally designed in Europe, Aerial Adventure Parks have recently emerged as a new and unique outlet for outdoor recreation in the United States. Almost anyone can come and enjoy obstacle trails of various degrees of difficulty while being suspended in the tree canopy. Different types of obstacles, such as zip lines, barrels, cargo nets, and bridges are connected between platforms and constructed around trees in a sustainable manner. Held to the rigorous standards put forth by the Association for Challenge Course Technology (ACCT) and the American Standard for Testing and Materials (ASTM), your safety is our greatest priority. We use a self-guided continuous belay in our Junior Park and double locking safety system in our aerial park. Our parks provide an experience that families can enjoy together. With various difficulty levels, trails, and elements, there is something for all ages, stages, and most ability levels to enjoy. No prior climbing experience is necessary! Our trails at TreeRunner are designed to challenge you both mentally and physically. Our Junior Park allows children as young as 4 years old to enjoy the thrill of climbing in the trees. Ecotourism has emerged as a new category of outdoor recreation that focuses on sustainability, personal growth, and environmental education. Not only does it emphasize the importance of environmental awareness, but it also promotes positive community impact and development.